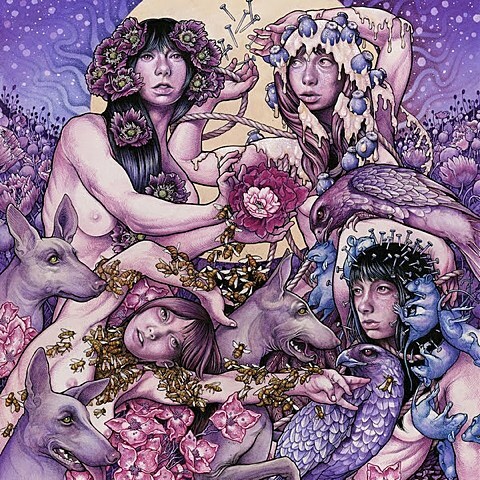 Baroness followed up 2012’s massive double album Yellow & Green with their shortest album yet, Purple. It sounds like a culmination of just about everything they’ve done so far, and if you’re a longtime fan you’re pretty much guaranteed to like it. Today they play an afternoon in-store at Rough Trade (you had to buy the album from the Rough Trade store and get a wristband) and a sold-out night show at Saint Vitus. Earlier this year, Long Beard released their debut album, Sleepwalker, a very solid mix of slowcore, indie folk, dream pop and more. Tonight’s their first of three Brooklyn shows before the year ends. New York singer songwriter Jared Samuel, who has played with Martha Wainwright, Sharon Jones, Cibo Matto and Ghost of a Saber Tooth Tiger to name a few, makes his own quirky, poppy and danceable music as Invisible Familiars. This is part of his December residency which happens every Sunday this month at Ace Hotel. As star of one of the greatest holiday albums ever made — A Christmas Gift for You from Phil Spector — Darlene love Christmas shows are always full of joy and good cheer. It’s the two-year anniversary of Brett Davis and Sally Burtnick’s comedy show The Macaulay Culkin Show (which has nothing to do with the Home Alone star), and they’re celebrating with guest JD Amato, Colin Burgess, John Early, Conner O’Malley, Jacqueline Novak and more. Legendary LA band Los Lobos begin their now-annual holiday run at City Winery tonight. This sold-out comedy fundraiser is a benefit for UNICEF, with proceeds going to children in Syria. A great lineup of talent awaits those with tickets. Meanwhile over at Union Hall it’s “Comedians and performers from all walks of life join together for the sole purpose of messing with your brain.” An insane cavalcade of performers include Taylor Moore, Jo Firestone, Brett Davis, Ana Fabrega, Cole Escola, Aparna Nancherla, Bobby Tisdale, Mary Houlihan, Noah Forman, Lorelei Ramirez, Anna Drezen, Dru Johnston, Joel Kim Booster, Gary Richardson, Ike Ufomadu, Langan Kingsley, Danny Groh, Drennen Quin, Carmen Christopher, Matt Dennie, Bowen Yang, Anthony Oberbeck, Matt Rogers, Joey Dundale, Andrew Tisher, Sam Taggart, Michael Wolf, Megan Doherty, Reka Shankar, Zach Cherry, Nicole Pasquale, Evan Altshuler, Cory Palmer, and Dan Glaser. Later tonight at Union Hall it’s a holiday edition of Cheap Date, featuring MST3K alum Frank “TV’s Frank” Conniff, Aparna Nancherla (who is busy today) and more.